Pinkadots Elementary : Falling in Love with Close Reading! Academic Reading...What are you reading? Falling in Love with Close Reading! Academic Reading...What are you reading? I don't know about you, but I am constantly reading new educational books, blogs, and articles in order to become a better teacher. I love learning new strategies and skills to not only help me, but more so help my students. 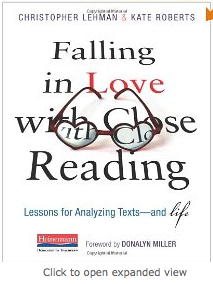 The new book, my literary coach, Kara, and I are reading is Falling in Love with Close Reading, by Chris Lehman and Kate Roberts. Our principal actually bought the whole staff a copy of this book because she loved it so much. I haven't finished it yet, but honestly with a forward from Donalyn Miller, the Book Whisperer, this book HAS to be awesome. Kara has been teaching some lessons from this book in another classroom and tomorrow it is my turn to team teach with her. I am super excited to help the students to "look through the lens" (like the book teaches) and closely read parts of Martin Luther King, Jr.'s famous speech. 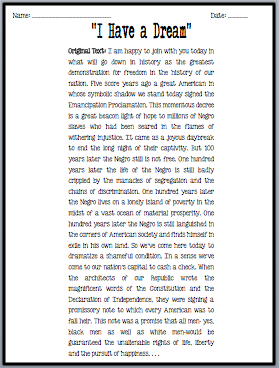 This is one of the worksheets we will be using in the lesson. I can't wait to tell you how our lesson went, show off some student work samples, and give you some freebies...tomorrow! Do you have any suggestions for educational books? I'd love to hear what worked for you. I totally want to read this book! I have been trying close reading all year and love the strategy. I just feel I can do more. I read the book Notice and Note to help me with close reading of fictional texts…an AWESOME and easy read!